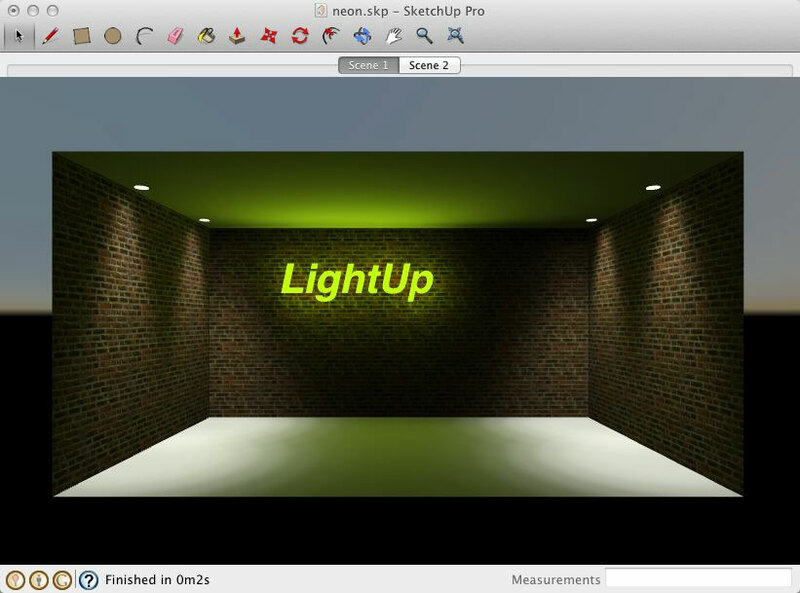 This tutorial will show how to use Material properties to control how LightUp illuminates surfaces and then use this with realtime Bloom. The model is kept very simple so we can focus on the techniques. 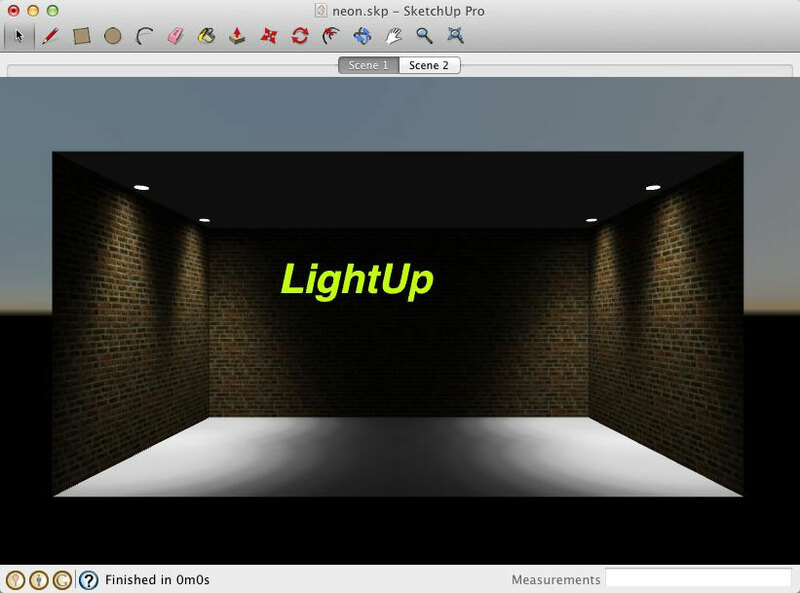 So we will start with a simple room with 4 LightUp PointLightSource downlighters using ERCO luminaires. 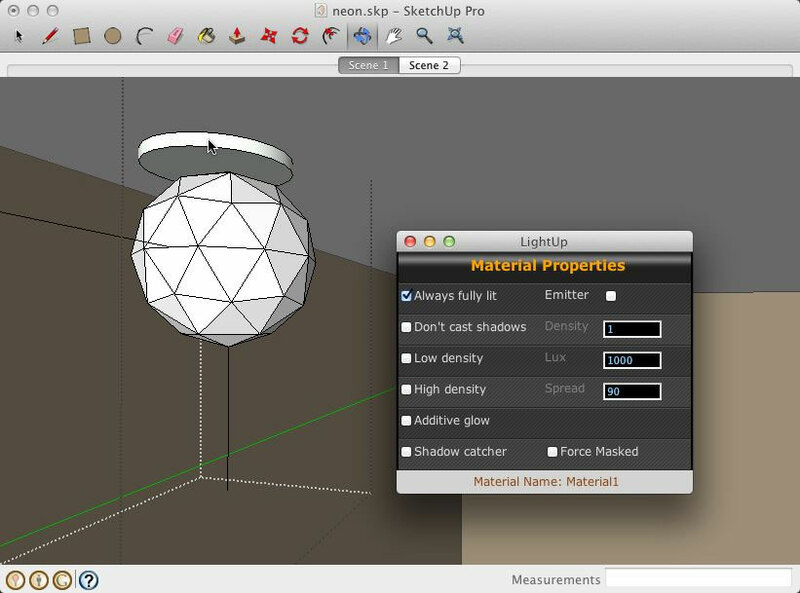 We’ve unchecked “Use Sun” in Preferences as we just want interior lighting. 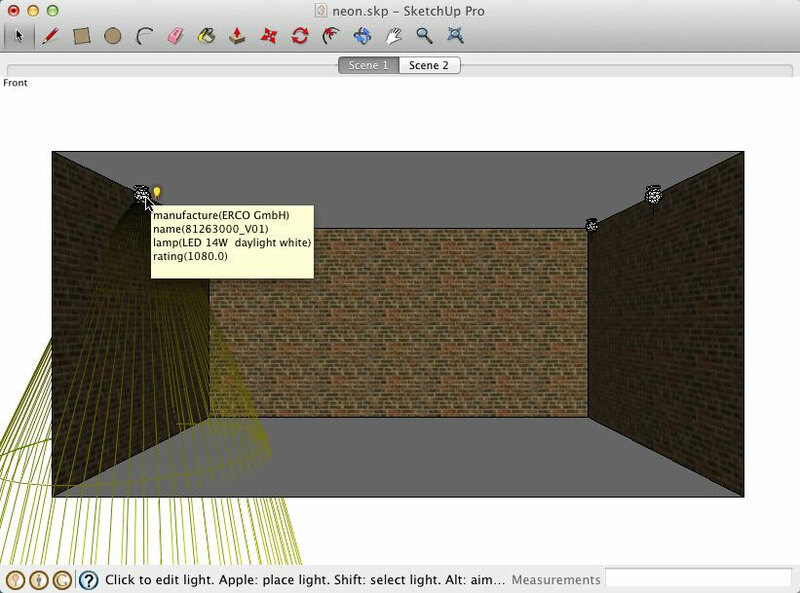 Using the LightUp Query tool we can hover over a light to show its photometric information. 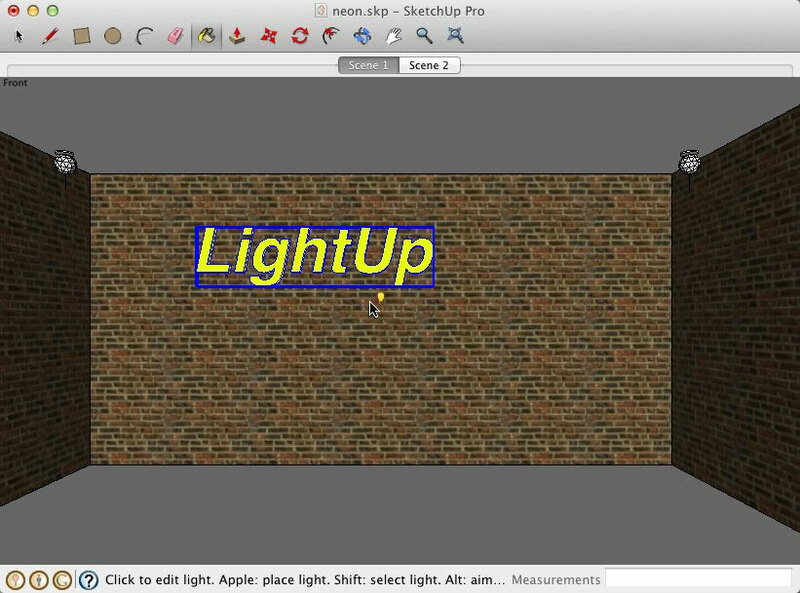 The PointLightSource component in LightUp controls the location, profile and color of the light source – but says nothing of the actual physical housing of the light. So we’ve added small geometry disc above the light source. We’re going to mark the material used by this disc so that LightUp will always draw it at full brightness – we want to give the effect of the disc being the source of light. 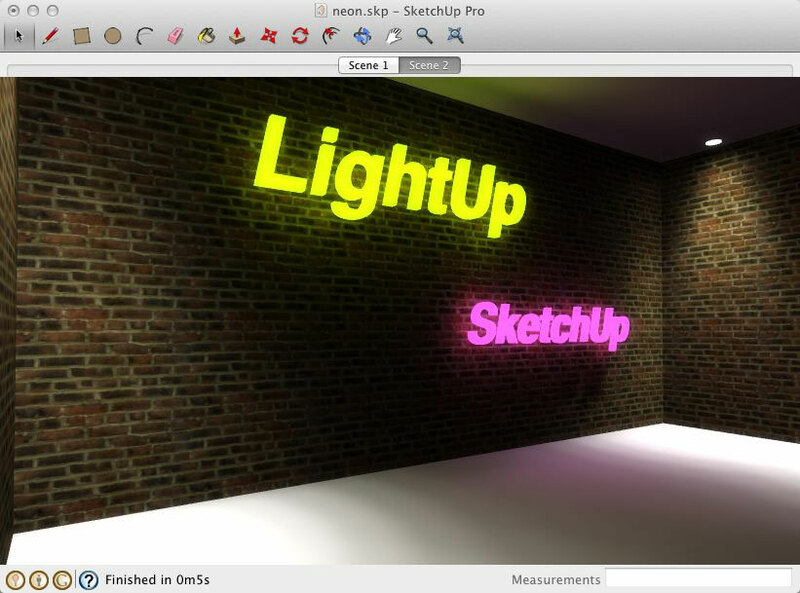 We do this by clicking on the Material using the LightUp Query tool and checking the box “Always fully lit”. Starting up Tourtool should give you a result as shown below. You can see the disc geometry showing up nice and brightly because we’ve marked it as “Always fully lit”. Marking materials as “Always fully lit” means regardless of what lighting actually falls on the surface, LightUp will draw any geometry as if it is brightly lit. Effectively, the material is “self illuminating” because it needs no other light sources to be bright. 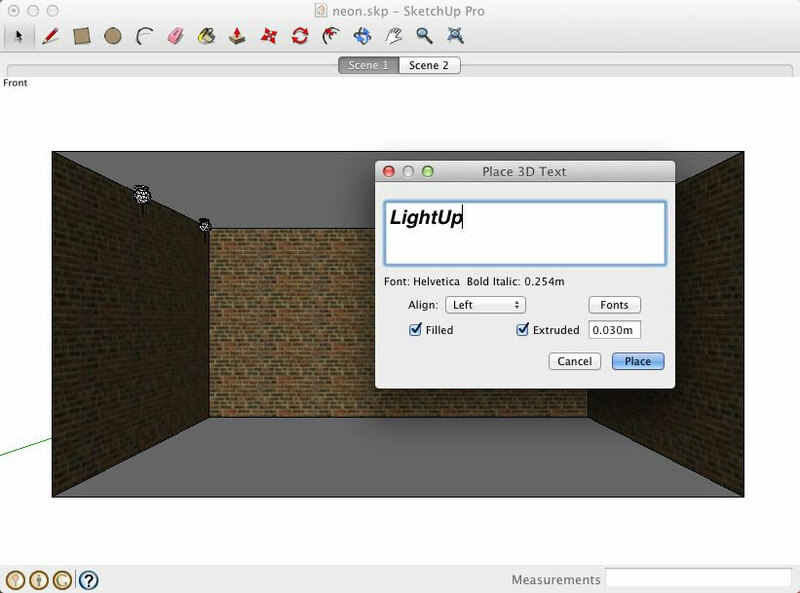 Using the SketchUp “3D Text” tool we’re going to create a Component that we’ll make glow in our model. Open up the new Component geometry and assign a new Material to every Face. Using the LightUp Query tool we mark this material as before as “Always Fully Lit”. 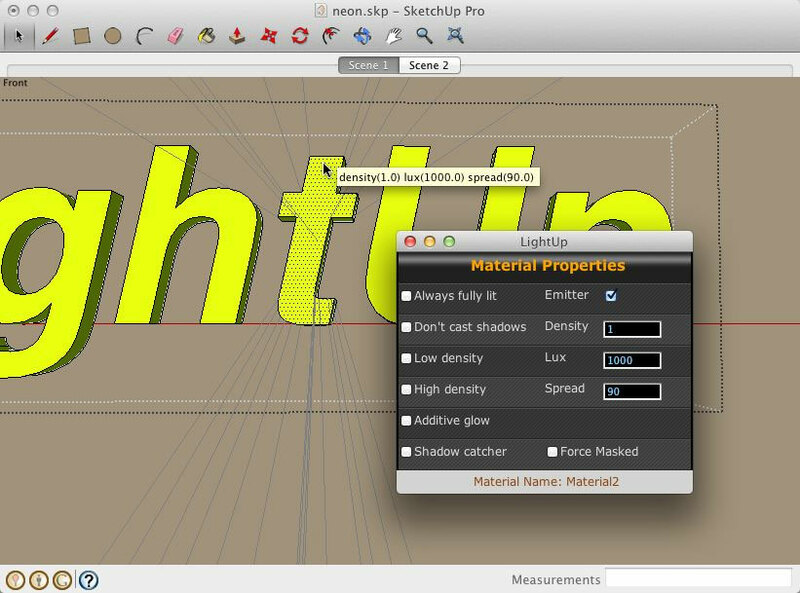 Starting Tourtool again, our new 3D text shows up as if its lit from the inside. But the effect has no other effect – it doesn’t color any surrounding surfaces so doesn’t look right. However, we can go a long way to fixing this problem just with “Post processing effects” that are built right into LightUp. While in Tourtool, we can open the Color Adjust dialog and adjust the “Bloom” and “Bloom Start” controls to make our 3D sign glow (the effect we are looking for). Tweaking Post processing controls can often quickly give you the effect you’re after – (TIP: Use the dropdown Schemes to save up to 5 different settings so you can see which you like best). 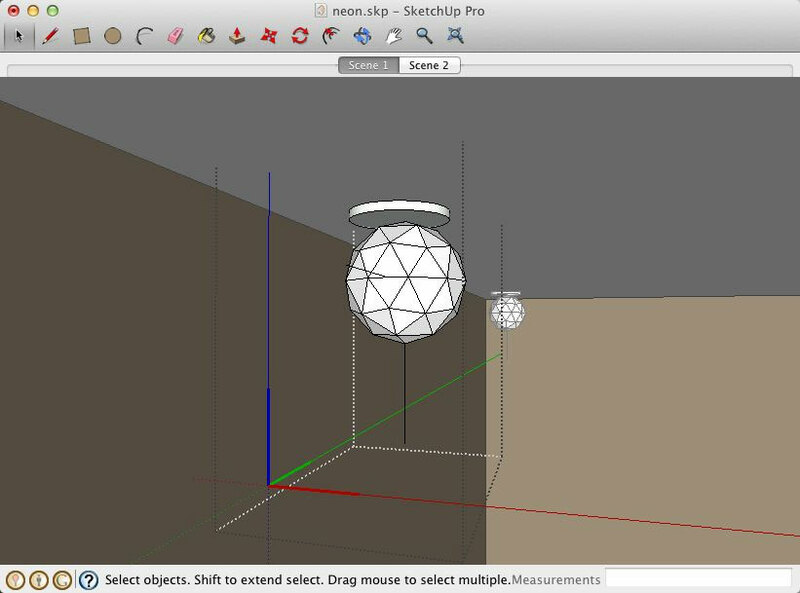 However, if you want the sign to actually illuminate the surrounding geometry in your model, you need to mark the Material as an “Emitter”. This will make LightUp treat all surfaces using this Material as light sources and correctly illuminate the surroundings. 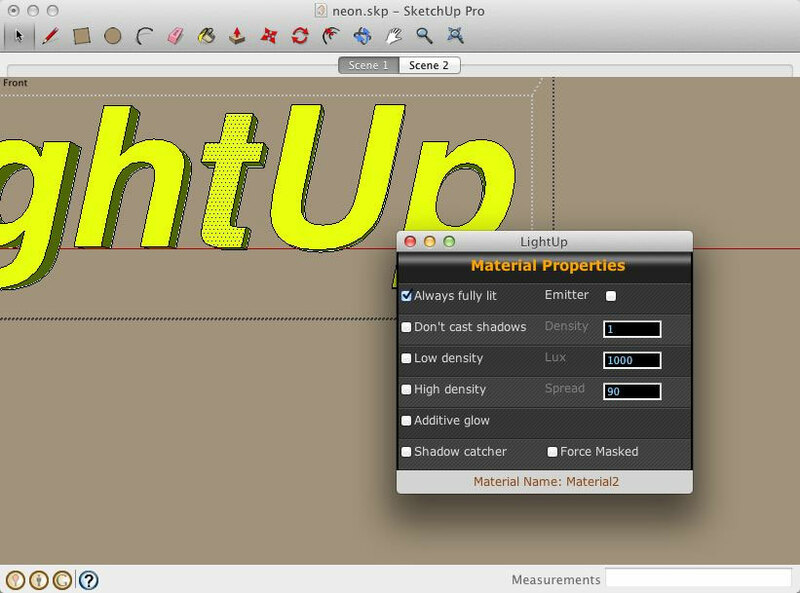 Opening up the sign Component again and using the LightUp Query tool, we mark it as an “Emitter”. All Emitters are always drawn Fully lit, so we can uncheck the “Always Fully lit” checkbox. 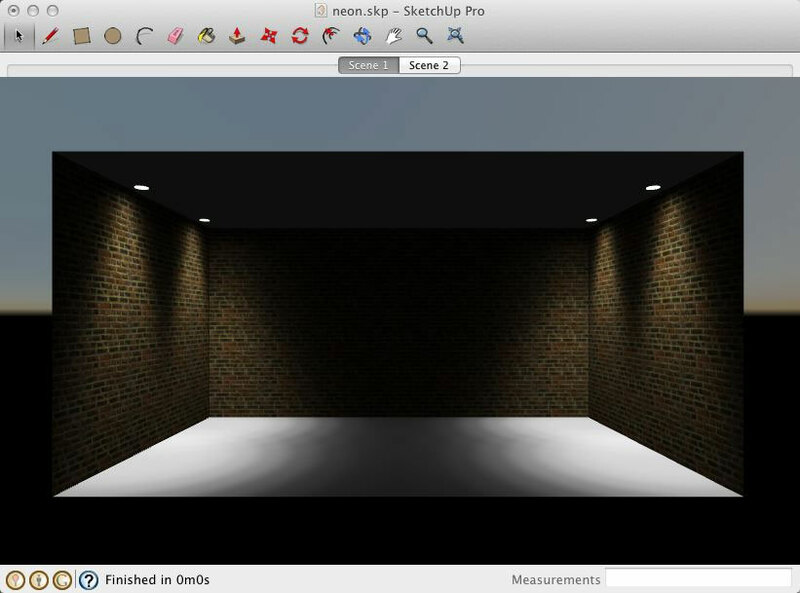 Starting Tourtool again with our new Material settings causes a relighting with the results like shown below. You can see the sign is illuminating the brickwork around the sign and the ceiling and floor too. The amount of light emitted by a Material emitter is a function of how large the emitter is. A tiny surface emits a small amount of light; a large surface much more light. We can adjust the power of Emitter Material using the Query tool. Turning down the power of the emitter material to 200lx (lumen per square meter) and also adding in the Bloom effect we used before gives us our final image of light emitting surfaces. 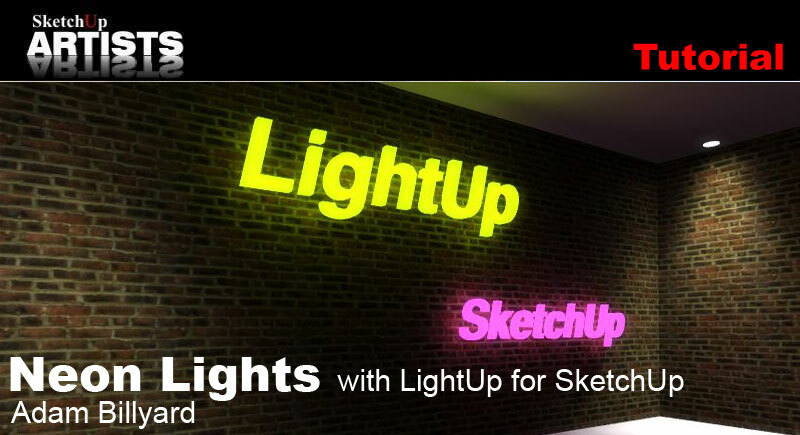 Find out more about Adam Billyard and LightUp for SketchUp over at the main LightUp website and see examples of some great renders too. 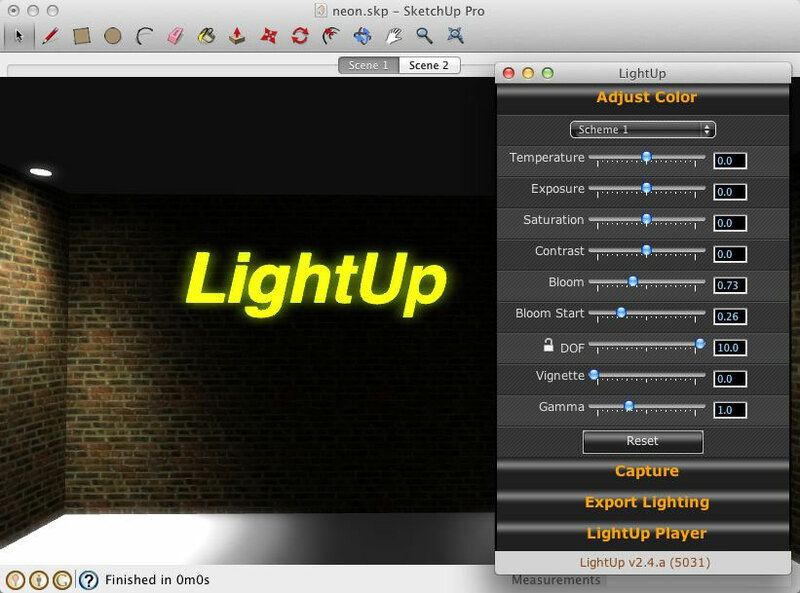 You can also try the LightUp demo free for 30 days if you want to follow these tutorials. Visit their homepage to download free trial.